First I will explain what HCI means. It stands for Human Computer Interfaces, what this in relation to games is- how the computer and the player interact with one another, this could come in the form of Heads Up Display, Leaderboards, Online Stores, or Controls (whether it be console controller, mouse and keyboard or other means). A Heads Up Display is usually shortened into HUD for simplicity. The HUD in a game is fundamental in how the game is played, this can change dramatically from game-to-game. It is active when actually in gameplay and it can come in the form of many things- Maps, Health, Shields, Power, Ammo, Funds, Wanted level, Laps, Speed and so on. 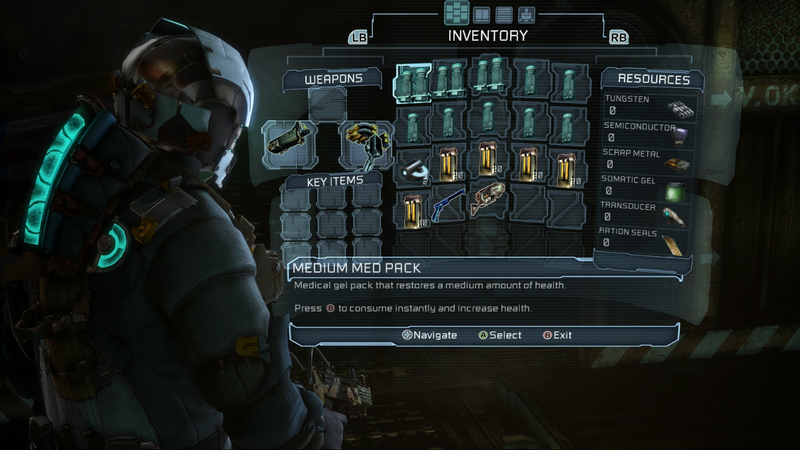 Sometime the in-game menu is incorporated into this like in Dead Space, where the menu does not fill the display and you can still take notice to the gameplay while viewing it. I will now look at how two different games’ HUDs differ from one another. Lets take Halo: Reach and Forza Motorsport 5, they both vary in what information is displayed, and how it is shown to the player. 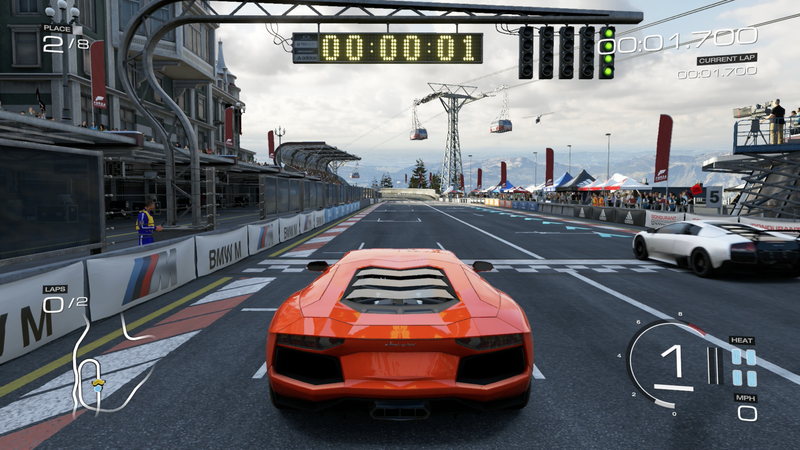 In Forza, it being a racing game, the HUD shows Position/Place, Laps, Map, Times, Speed, Engine Revs, Gear, Tire Temperature and last but not least Controller Trigger Pressure. This type of Heads Up Display suits the needs of a racing driver while driving around a track, the player can use the information shown to help them dramatically. For example, if it is the first time playing a specific track, then you can glance at the map and get an approximate idea of what type of corner is coming up, or if there is a straight run afterwards. Another interface is the speed, this helps the driver significantly. Because of the high speeds you race at while playing racing games like this, you could be going over 200MPH and not even think your breaking the 50 mark. Due to the speedometer being displayed, the player can also get an idea of what speeds they can take a corner in what cars, without this you would just have to guess at what speed you’re going, and what speed you need to be at. A disadvantage to using this form of HUD is that, because things like the map, speedo and gears are so useful and crucial, the driver may feel obligated to look at these, this could distract the player and therefor cause a crash or loss. 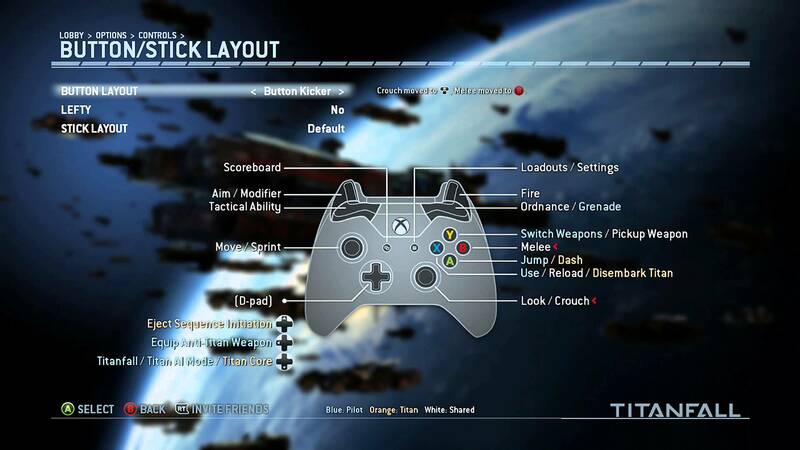 Now lets look at the Heads Up Display in Halo: Reach. It is very different compared to Forza, or any racing game for that matter, they seem to only share one close similarity- the map. In Bungie’s title, it is more of a reader styled map, whereas in Forza it is displayed as a single-line mapped out track. They are both very suited to the type of games they are, for example, if Halo had the map design of Forza, then it would take the player a lot longer to see where about enemies or friendlies are relative to your character. Due to Reach having this radar styled navigation, the player can very quickly glance at the map and have a very good idea of where other players are in comparison to themselves. Another feature of the Halo HUD is the Ammo Count, this is almost mandatory in an FPS game, without this in the HUD it would be very difficult to keep track of how many bullets are left in your reserves, and in the magazine. The way Bungie have opted to display this interface is by having it located on the actual weapons itself, and in the top-right of the screen, they did this so that if you are in a gun battle and it is crucial you don’t take your eyes away from the action then you can very quickly glance at the weapon and still have a lot of attention on the fight. Whereas if you are a player used to other FPS games such as Call of Duty or Battlefield, then it is an easy transition as you are quite used to having the bullet count on the outside HUD, not on the gun itself. 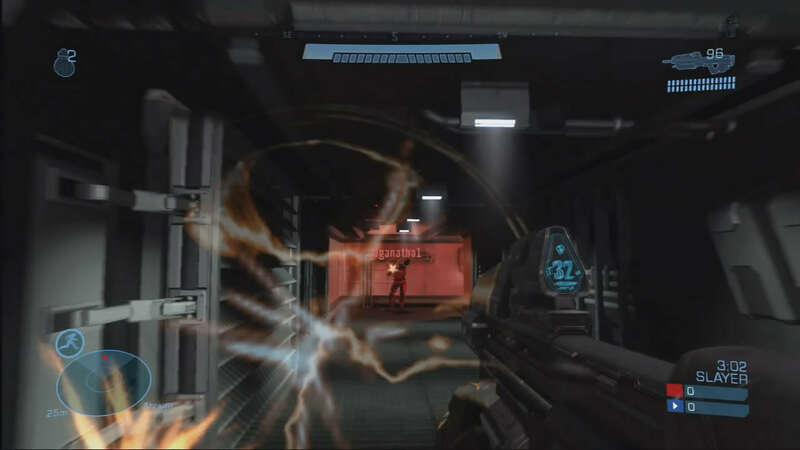 One last feature of Reach’s Heads Up Display is the Health and Shield bar positioned at the top, this can be shown in many different ways, for example Dead Space displays this in the form of a light bar on the back of the character. Bungie has decided from the start that the health and shield bar/bars would be displayed at the top of the screen, there are two sections to this interface, the Shield bar (above), and the Health segments (below). A health bar or indication is very useful in an FPS game, this is because when in a gun fight you can make a judgment whether or not you can keep engaging the enemy, or flee and keep you life for another attack later. The last thing is I would like to mention that Bungie, in their more recent Halo titles, have designed the HUD to appear as if it is inside Master Chief’s helmet, doing this helps emerge the player into the idea that you are encased in a suit and enforce the futuristic environment. Different types of interfaces carry across from one genre to another, this is due to it being useful in both scenarios. For example the map display, was slightly different, but it carried over into both FPS and Racing, although this would not work for a lot of other features such as Ammo or Speed. It would seem that not many features are crossed over, but there are more than you think. For example, in both games there are form of Times, Position, Map (as mentioned earlier) and some more types on other titles. This just shows that some information is just necessary on a number of different genres, it also shows that some is not (Compass). Controls are the main method of inputting player commands into a game. This can come in the form of a Console Controller, Keyboard and Mouse, Kinect, Wii Remote, PlayStation Move, Multi Touch (Mobile device screens) and other similar types. Without these forms of input commands, games would not be able to be played and therefore becomes just a basic video. The controller, whether it be a keyboard or console controller, is in a way a very simple way of playing a game, as the CPU interprets the commands you input, and turns them into usable information for the playable world. On the PC platform, the controls don’t really vary between computer to computer in terms of the keyboard commands, but on console, as there are many different variations of the controller. For example there is Xbox 360, PS3, PS2, PS4, Xbox One, Wii U, 3DS and many more going back generations, all varying in some way or another. What I mean by this is on the PS3 controller there are four push buttons on the right hand side- X, O, SQUARE, TRIANGLE, whereas on the Xbox One there is the same sort of configuration, but the buttons are A, B, X, Y. This can affect how games are played, whether that be cross-platform, or console specific. Now I will compare a couple of different types of game which both vary in control methods- Titanfall and Dota 2. These are very different games, so they will be very good examples to explain the advantages and disadvantages to each method of control. 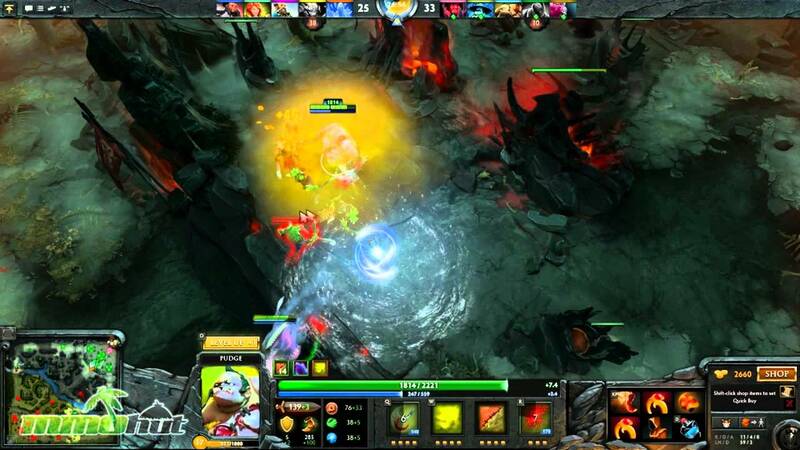 Dota 2 uses the mouse for the main type of control around the game, as it is a point-and-click sort of title. It isn’t completely necessary, but you can also use the keyboard for easier movement around the game and for short-cuts to powers and abilities. An advantage to this is that you can use one hand for complete control of the player and camera, whilst still having the other hand free for any of your abilities. Another point to using the keyboard in this game is that your fingers can always be over the top of all of the abilities at once so it would be a lot more responsive and less complicated to activate them. In Titanfall, and most other FPS games on consoles, you cannot have your fingers over all of the possibly useful buttons/commands at once, due to this, it may take longer to activate the commands you wish. One way players have acted to evade this issue, is to buy custom-made controllers (Scuf Controllers). These tend to have extra buttons on the rear of the controller where you have a few free fingers to operate buttons, unfortunately on the official controllers from Microsoft and Sony, there are no extra buttons there to take advantage of this. The rear buttons I talked about aren’t entirely new buttons as such, but they bind to any button on the front of the controller where your fingers cannot usually simultaneously press, this creates a much more responsive experience for the player (if you can handle the extra buttons). One advantage to the console version of Titanfall of Dota 2, is that it uses a console controller. 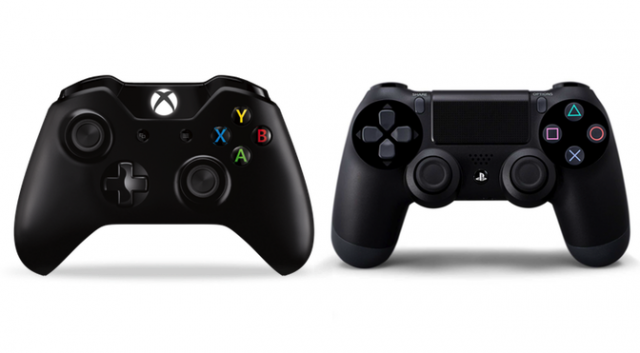 A console controller is generally a lot more comfortable to hold compared to a keyboard and mouse and because of this, you can play while being a lot more relaxed. This is why consoles tend to have a lot of success in the general market, as there are a very large amount of people who like to just sit back on the sofa with their friends to enjoy an immersive title. An advantage to the keyboard and mouse combo is that it is (arguably) a lot more precise, this is because of the mouse input method. The mouse allows for very agile movement (as fast as your reactions will take you) in games, especially when it comes to genres like FPS. The reason behind this, is because with a mouse you can move the camera (aim) to a point in the game very quickly, whereas with a controller, the joystick has a very low movement area and therefore it can be more difficult to achieve the same amount of stability and preciseness. This is also semi-counteract-able with a device made by Kontrol Freak, they are attached to the top of any joystick on the controller, and doing this increases the area of movement, and stability dramatically.